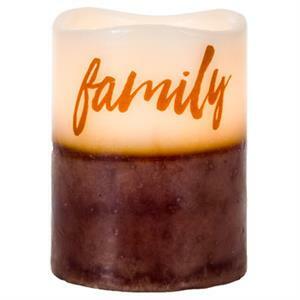 Brown Vanilla Sugar Family LED Pillar Candle - 3" x 4"
Home > Candles > Brown Vanilla Sugar Family LED Pillar Candle - 3" x 4"
Give the gift of a warm glow to your comfy home with 3" x 4" Brown Vanilla Sugar Family LED Candle. Featuring rich brown base, an ivory top, and brown "Family" text design, this pretty, vanilla sugar scented candle is perfect when used alone or with other candles for a lovely candle display. Insert two AA batteries (not included) and light the way to beautiful and stunning decor.